Have you ever dreamed of noodles that are not only gluten free, but also contain no calories? Well, look no further! Shirataki noodles are a great food for anyone with food allergies, as they are vegan and gluten free, and naturally contain no calories. Shirataki noodles, otherwise known as “yam noodles,” come from a yam-like tuber named Devil’s Tongue. 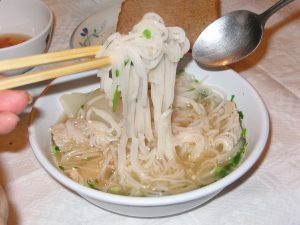 The process to make these noodles involves removing starch from the tubers, then mixing the starch with water and limewater to create something called konnyaku. This substance is then shredded to create the shirataki noodles. When cooked, the noodles have a slightly gelatinous texture and very little taste, so they are best accompanied by bold flavors or cooked in a robust broth. These mild noodles will take on the taste of whatever you cook them with, opening up endless possibilities for you to create unique and personalized flavor profiles! You can locate shirataki noodles, both dry and cooked, at most grocery stores in the refrigerators where the tofu is kept.